Discover how to improve customer service with new insights to get to the heart of the issue. Every business has to create systems to improve customer service. 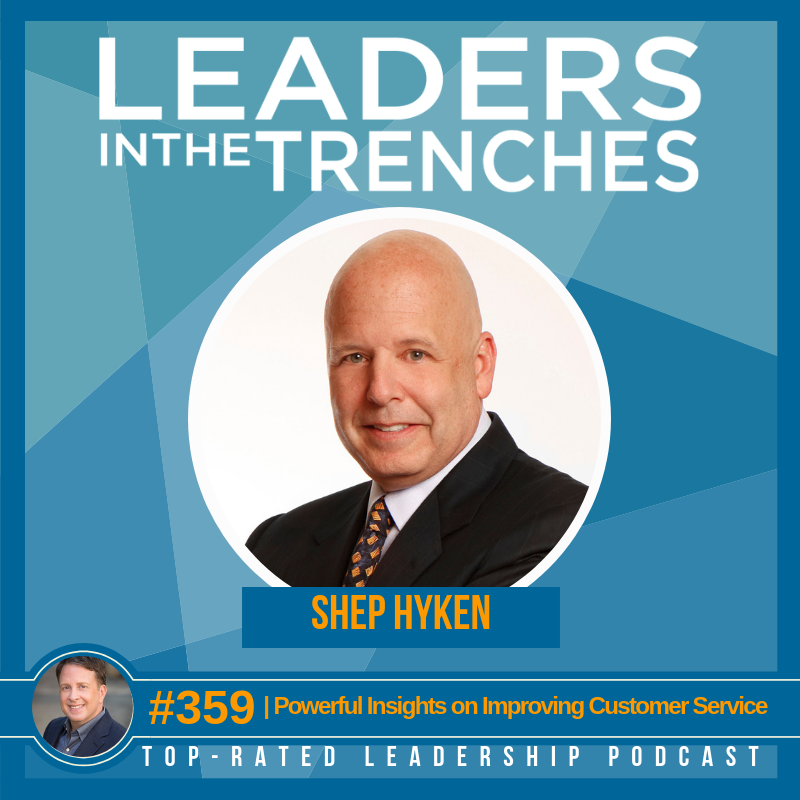 Today’s interview is with Shep Hyken, a true master of customer service. Shep shares with you how to think about customer service and what to do about it. Today is all about how to improve customer service. Target Audience: Shep is an American customer service expert, author, and speaker. His book, The Amazement Revolution, was a bestseller. Shep Hyken’s most requested programs focus on customer service, customer loyalty, internal service, customer relations, and the customer experience. He is known for his high-energy presentations, which combine important information with entertainment (humor and magic) to create exciting programs for his audiences. Gene Hammett: Hi, this is Gene Hammett. I’m your host and leaders in the trenches. Today we’re going to have a big question for you. How could you make customer service a competitive advantage? Companies like Amazon and Uber have definitely understood the important of convenience and creating frictionless service and experience with the customer, but I want to ask you in your growth strategy, how can you do that? How can you be different from the competition? How can you create fiercely loyal customers? Well, I have an expert today on our interview show. Today is Shep Hyken. Shep wrote the book on customer service. We’re going to tell you all about it today, but before you wrap up, make sure that you download the culture scorecard. It’s GeneHammett.com, forward slash culture. It’s all about your score on where your culture is right now and how you can improve. Now, if you’re ready for hypergrowth, if you’re ready to really up your customer service game, this is the interview for you. So here it is with Shep Hyken. Shep Hyken: I am doing fantastic. How are you doing? Gene Hammett: Great, it’s a great Monday. 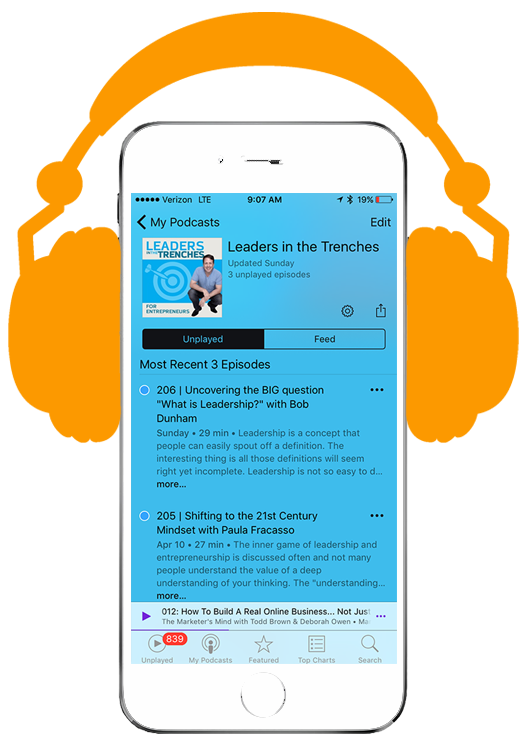 I’m excited to have you on the show and leaders in the trenches you’re in for a treat here because it’s got some really strong message here that will really help you grow your business. So Shep. I’ve already let them know a little bit about you. Can you tell us a little bit about you? Maybe it’s not commonly known and uh, who do you serve in the business you work with? Shep Hyken: Sure. Uh, well, I mean, who do I serve for? I work with companies that want to build loyal relationships with customers and employees. Okay. That’s everybody. So who doesn’t want to do that? Uh, my goal is to help our clients build amazing experiences for our customers. If you were to walk out of a business and you hear somebody say, you say, wow, those people are amazing and that’s what we help our clients to create those amazing customer service type experiences. And I actually started my first business when I was 12 years old. A lot of people don’t know that. Although when people say, give me your background, that’s one of the things I’m most proud of. Twelve years old. I was a birthday party, magic show magician. And uh, that’s what I did. I had fun. Came home after my first party. My parents told me that I was going to go write a thank you note. I thought when my mom said, what are you going to do after dinner? There correct answer was homework, but no, they said write a thank you note. And that was my first lesson in customer service and my dad said a week later you call the parents again. You thank them again. You ask them how they liked the show and if they say they liked the show then say, well, what tricks did you like? Shep Hyken: And whatever tricks they didn’t talk about, that’s your opportunity to improve. So my dad was teaching me and my mom and dad, but the show appreciation, get feedback, process improvement all at age 12. And then my dad, master salesperson said, you know, when they say they loved your show, asked for the names and numbers of the people, the back of the room who are watching your kids be entertained, those are the parents. And I did. And they gave me the names and numbers. And within a year and a half I’m doing eight, 10 magic shows every week making more money than my teachers at school. And you know, there’s your hypergrowth. And so, uh, but that’s the joke about that. That’s my customer service and business background. Starting at a young age today, you know, I work with companies that range from the smallest of businesses. I’ve walked into organizations that have 15, 20 people had been in a room to do a speech for six people all the way up to working in stadiums for large companies that rent out an entire venue that, you know, bring in 20,000 employees. So, uh, all over the place. But the message is always core. And that is how do we create amazing relationships for our customers? And even our employees are in amazing experiences. Gene Hammett: Well, you know, I like a lot of companies struggle with this and I know it’s not easy to get right in scale. Um, I was actually on the phone with a bad customer service company. I’m going to say the name because they did a really good job. Is that okay? Shep Hyken: A bad customer service company that did a good job? Were they in the cable industry? Gene Hammett: Yes. I was totally blown away at the care that this person took to just listen to me. She goes, well, you know, why do you want to cancel your TV service? And I just talked to her and I said, well look, you know, is it a price thing? And I said, well, partly, but I also don’t watch TV that much. And she’s like, well we’ve got a package and she completely redirected me into to what they wanted to offer. And I thought she did a great job. I mean, are you running into customer service situations where it’s really easy to see these? I know from an outside. Shep Hyken: I’m looking for that I’m acutely aware of, but let’s talk about the cable industry for just a moment because they do have that reputation because do you want to know when you’re, you find out your cable isn’t working only when you’re watching the show or to watch the show that you plan to watch, right? Shep Hyken: That’s when you realize it went down. It doesn’t work and you get frustrated and then you call only to find out there’s an outage and there’s 5,000 other people that are calling the exact same time and you’re, all you’re getting is recording. And yet if it’s for different reasons like yours, well that’s easy to do. But let me test some cable companies like, uh, do a little bit of work with comcast and I’m learning what they are doing. And I interviewed actually, uh, one of their executives for our little show that we have here, amazing business radio. And one of the things they talk about, why do they get a bad reputation when they’re doing all of these things? Well, if your cable goes out, they’re going to inform you like five different ways. Obviously they, you know, if your Internet and your cable that’s out, they can’t send you a message via email, although they can because you get email on your phone, they can text you, they can, uh, they can send a message a recorded to your phone lines, which oftentimes is or is not connected to the Internet, so they may get you that way. Gene Hammett: I’ll tell you, the company that I had that experience with today with comcast. Hey, there you go. I don’t know who your interview with, but I just because of me, you know, I saved 38 bucks on my cable bill today, which is that much money, but my wife has been asking me to do this for two weeks and I finally did it because it’s in my name. Well, we’ve been talking about customer service. I want to kind of back up for a second here. Why is customer service so important from your perspective? We all know it’s important which give us, give us the from your perspective Shep. Shep Hyken: Sure, and especially because our audience are people who run businesses, small or big. It doesn’t matter. We need to recognize this, that if you aren’t going to deliver the service that your customers expect, and I want to talk about what that expectation is in just a moment. Your competitor is because everybody, not companies, customers are acutely aware of what good customer service is and here’s how things have changed. Customers are smarter than ever before. They don’t compare you to your direct competitor. They compare you to the best service they ever had from anywhere, and that could be from a huge company like Amazon who gives great service and a great experience. Shep Hyken: That comcast experience that you just had was great, but how about the guy that just sold me a pair of shoes for $25? They were on sale. They were. They were 60 percent off. He was knowledgeable. He was helpfully saving money. I’m thinking, why can’t all the people I deal with be as good as this guy? Right, and so this is what’s happening and the question is, are your people willing to step up and deliver at the customer’s expectation? Not what’s compared to your competitor. By the way, if you look at all the surveys that are out there, like 81 to 85 percent of c level type people are saying that the customer experience is going to be the number one investment that they make in the next two to three years. So right there, you know, if you’re gonna compete, you’ve got to compete at that level. Shep Hyken: And again, you could be a solo entrepreneur and maybe you don’t have millions of dollars to throw at it, but you’ve got the philosophy to throw at it to make sure that your customers say, wow, that’s the best company in whatever it is that you do that I’ve had the pleasure of dealing with. Gene Hammett: Well, I love the way you talk about that expectations and I think a lot of times we think that might be too hard to meet expectations when the reality is. Many times I had very low expectations coming into my comcast called today went really well. I was like, about this. Shep Hyken: They would love for you to tweet about it. Please do. Gene Hammett: How does someone get a handle of what is expected of them in customer service? Shep Hyken: Well, I think one of the best things you can do is just talk to your customers and you can survey customers and we all are familiar with different types of surveys. My favorite quick, simple survey is nps, the net promoter score, but there’s good and bad to that. I think it’s mostly good, but let me inform you of the potential downside. If you’re asking it the right way, you’re going to get information about what you want based on this interaction. So when you just dealt with comcast based on this past interaction that you just had, on a scale of zero to 10, what’s the likelihood that you would recommend this to a friend? I wrote something down and let’s see if I can find it. I think it’s right here. I was dealing with American Airlines. I Osha, I tell you the name of the company yet because I love them and they asked if I would be willing to take a short one question survey at the end of my interaction with whoever I was getting ready to talk to and if I could read my writing here is a simple question they asked. Shep Hyken: Okay. On your next, uh, call to American Airlines, would you be happy to work with the same representative? Boom. Think about that. Is that an amazing question? That they do a good enough job that you would ask for this person by name? Powerful question. Now, what I like about nps is you get an idea of whether or not the customer would be willing to recommend you. That’s the question that I just mentioned from American Airlines. That’s an intent. I wouldn’t if I called again, yes, I wouldn’t be intentional and ask for that person, but let me tell you where the rubber hits the road and that is behavior. The question is, does the customer come back regardless of whether they give you a nine or a 10 on a scale of zero to 10, the real question is, did they come back after that? Are they a repeat customer? Do you consider them to be loyal and that you can count on them coming back because that’s a big difference. Shep Hyken: The convenience revolution subtitled. How to deliver a customer service experience that disrupts the competition and creates fierce loyalty. So how did this come about? I was working on my last book and I started to think, what are companies doing different today? What are these? Just as you measured these hyper growth. I said, what are these rockstar company’s doing that’s a little bit different? Shep Hyken: How did Amazon take over not only the book industry but the entire retail industry? How does Walmart do what they do and their version of their retail world? Uh, how did uber do what they did? And I started looking at it and go, something hit me. I don’t know how it hit me. I said, they’re more convenient to do business with than their competitors. Wow. Amazon came into the book industry thinking they were just going to sell books and came up with a system where they’re open 24 hours a day, seven days a week. Once you’re in their system, all you do is log in, find the book you want, hit a button today. It’s one click, you know the one click purchase, you hit it and it’s done. They’ve got a little button you can adhere to the side of your washing machine. When you run out of washing machine detergent, you push a button and it shows up the next day. Shep Hyken: They’ve got, you know, all kinds of technology. They’re working in delivery systems. They reduce friction beyond belief, as I mentioned, the one push the button or just one click shopping and again, as far as service goes, they’re always good at. Here’s an interesting thing. There’s a, I think today they don’t have a phone number on their website for you to call for service. This is cool. So years ago they didn’t have the phone number for different reasons because Jeff Bezos said we should be so good that they don’t need to call us, so we don’t need to put a phone number on there. And the reality is they were that good until like the post office or ups or Fedex didn’t deliver it and it wasn’t Amazon’s fault, but who does a customer calls so they realize because of issues like that, they had to be available with today. Shep Hyken: If you have a question about something, they’ll take you through a number of prompts where you can self service your own issues and it’s really cool and interactive and intuitive, but if you get to a point where you can’t get the answer and at any time you can bail and they’ll simply say, what number do you want us to call you at? How’s that’s convenient. It’s easy, by the way, by doing it this way. They’ve eliminated a huge number of calls that they were getting. They’ve created a self service option that’s easy, and then it moves to a human backup, but you don’t call the human, they call you. It’s that simple. Um, so anyway, I talk a lot about Amazon in the beginning of the book because there are a great example of virtually every area of convenience and I probably like a good politician have now a swiveled to a different aspect of whatever your question was before. Gene Hammett: You’re right on target because convenience is, it comes back to time. Time is huge. We’re doing what we do in order from these companies is because we know it’s going to be stress free. Like I was sitting here wondering why I even had to call comcast to begin with. Why couldn’t I log in to and maybe I can’t do this and they just don’t produce it, but why can’t they call me? Shep Hyken: Yeah. I think they, they, I don’t know if they’ll call you, but they do have the option. A lot of companies today, when you get put on hold, they’ll give you three options. Do you want to hold for and they’ll tell you how long the hold is going to be. Do you want to hold for the next 20 minutes or would you rather us call you back in 20 minutes and if that’s not convenient, you want to put it in an alternative time to just key it in on your phone as to when we can call you back. Shep Hyken: That’s great. You know there’s a small little individual solo preneur mechanic auto mechanic. That’s your point. Saves people time is more convenient and what he did is he took all the tools and his little one garage shop and he put it into a large van and when you have an appointment, he comes to you. You don’t come to him out. Convenience is competition. There’s a car dealership that does the same thing. I’d been doing business with a car dealership for 20, almost 22 years, maybe 24 years and one day I happened to be driving by another dealership, not very close to my home at all. This other dealership was less than a mile from my office so I can drop the car off, walk to work if they didn’t have a car for me to drive, so not a big deal. Very convenient, but this other dealership was about 12 miles away and there’s no way I’m going to buy a car from them, but I saw a car in the windows. Shep Hyken: I got to go check that one out. And I walked in and I actually test drove it and I said, you know, what is it going to take for you to put me in this car today? And the guy said, wait a minute, that’s my line. I said, seriously? The issue is I’m 12 miles away. If I have to bring my car in for an oil change, it’s going to take me an hour to get here. Forty five minutes to get here. You know this story. He goes, do you see a waiting room around here? And I looked and it wasn’t there. And he says, that’s because we have one. It’s over there. And behind the wall it’s very small because most people don’t wait. We will bring you a brand new car, loan it to you for the day. We’ll pick up your car, get it service. Shep Hyken: Even if it’s just an oil change, it doesn’t matter. We’ll bring your car back and then exchange it and we don’t charge you anything extra for that. This is the deal we would make you go shop it around to other dealerships if you want and come back and buy from us. In the next time you stepped foot in here will be to buy another car, not to get your car serviced. I go, wow, that’s convenient. And that’s how they want my business. They want it through convenience and it’s probably going to be one of those loaners. What’s that? Gene Hammett: It’s probably going to be one of those loaners that they give you. Right? Shep Hyken: We’ll get this. They loaned me a really cool what’s called the uh, well, I don’t need to tell you the name of the brand that was. Well, okay. I will. It’s Kirkwood. Adi, and they own. Shep Hyken: They loaned me a, um, it’s called the road. It’s like a kind of a souped up station wagon. Kind of reminds me of a little bit of the outback and I drove this. My wife says I love that car. Well guess what? The next car, we bought that car from that dealership. They’re not dumb. They’re very, very smart. He don’t give someone a lower level car because they won’t give them the higher level. Exactly. They’re going to want to move into that one. So that’s exactly what happened. And there’s many different ways to be convenient, you know, technology has created convenience in many ways. Think about when. Are you familiar with the no wait APP. I love this APP. Shep Hyken: Okay. It’s a little company. They created this thing called the no wait app. It’s not in every city, but it’s moving forward and like here in St Louis where I live in and the number of other cities, if I want to go to a restaurant, I see if the restaurant is on the APP list, if they are, I could see is there a weight and it says yeah, there’s an hour and a half wait. So I put my name in at the bottom of the list and I can watch my name moving up that list over time. And finally when it’s about 10, 15 minutes away, I go, okay, time to leave to go to the restaurant. And I walk in and there’s virtually no weight. I mean that’s convenience. And you mentioned time. That’s why it made me think of this particular vehicle to convenience, but they use technology to make it happen. Gene Hammett: Let me ask you a question. There’s a lot of people listening to this that maybe they’re not an Amazon level leader, they’re not, you know, Audi and whatnot. What questions would you give someone that has got a growing business that would help them increase their customer service and, and maybe even thinking about convenience in a different way to make it a competitive advantage. Shep Hyken: There’s so many ways. And by the way, when I mentioned Audi, it was a small dealer, not a, the whole corporation. They sell other vehicles and they do the same thing for all of their lines. That isn’t about the brand. It’s about that dealership. And that’s important. And uh, that a Rom or whatever his name is, the mechanic who has just as one little, one little van. But man, he is always busy. He’s never down. So anyway, I digress. What are the things you should ask yourself? Well, simply this, I’m ask actually ask your customers. I have a thing I call the one thing question and it’s what one thing would you suggest that would make doing business with us easier? And listen to what your customers say. So that’s a great place to go. The other thing is look at the different areas of convenience. Depending upon your business, I’ll venture that you could probably incorporate, if not one, maybe three or four, even all six of the principles into your business. Shep Hyken: You’ve got, first of all, can you reduce friction and companies like Uber, they’ve reduced friction toward, that’s their main value proposition, but anytime you can make the process easier, look at all of the top line interactions you have with your customer and just ask yourself this at this particular interaction, can I make it better or easier for my customer? Example, in the simplest way, when you call our company, do we answer the phone or we’d put you into a virtual response system and make you push buttons and make you try to read, spell your, your person’s name and you’re looking at the key pad and trying to, you know, do you make people do that or do you make it easier? So that’s just a simple interaction and it doesn’t matter how big or small your company is. Look at all of those interaction points and figure out is there a better way to do it? Shep Hyken: Can you incorporate some type of technology? One of the things that I’m a place, I don’t get my hair cut anymore, but I worked for a company that does cut people’s hairs and they said, you know, uh, we don’t take appointments. We get people on a waiting list. So what do we do? We make the waiting list available online. Similar to the no wait APP. You go on, you pick out your location of the store, you put your name in and you can watch your name, go up the waiting list. When you show up, they call your name. If you show up afterwards, they will hold your spot for one hour. So that’s pretty cool. You know, they’re very, very good at that. And again, these are franchisees that are small businesses, that particular client, so lots of different ways. Can you deliver something on an individual level? Shep Hyken: Wouldn’t you rather go to them then make them come to you. So that’s an example of being more convenient. If I’m supposed to have a phone call with you, wouldn’t it be easier if I called you so you don’t have to worry about just waiting your office, I’ll call you. And by the way, I will call you on time when you and I had this call today. I showed up one minute early, why? I know it’s a show and I don’t want to be late and I want to make my hosts wait because that’s going to irritate you and you’re not going to give me the best interview right now. I just can’t, but I want to be the best guest I can and I think we want to be the best vendor, supplier, the best, anything to our customers that we possibly can. So those are a few questions to ask yourself related to the different ways. Shep Hyken: Here’s a really powerful one. Can you incorporate some type of subscription model into your business? You would be surprised if the different ways you can create an ongoing steady stream of income from customers that would just be willing to pay you quarterly or annually or even monthly. Uh, just so they don’t have to think about it anymore. Example, as simple as maintenance contracts on, you know, any, any type of computer equipment. Back to my car dealership. I prepaid for four years worth of maintenance and then they would email me when it was time, call me if they didn’t hear from me and I would bring my, are they, would, they would bring their car to me. I wouldn’t be my current and set the appointment. I mean that’s pretty convenient. I just do it all up front. A subscription model, a dog food now that’s becoming a big company, but they will dry dog food in any other ongoing usables that you have, consumables that you have of the hardware store that knows that you’re going to come in every six months to buy filters for the furnace or the air conditioner would just simply say, give us your credit card, we’ll send you the, the, uh, filters every six months. You don’t have to worry about it. Again, kind of like a Ron Popeil set it and forget it. Gene Hammett: You know, I wanted to have you on here because he knew there would be some good questions around customer service that would help leaders and their teams really think about how they can make customer service competitive advantage because it’s, it’s not that hard, but you just got to have the intention to do that. So thanks for being here at leaders in the trenches. If our audience wanted to keep getting in touch with you, how could they follow up with you or, or get your book? Shep Hyken: Sure. Easiest way, just go to beconvenient.com. That’s beconvenient.com. And there you’ll not only see the book, but you’ll be landing on my website page and from there you can go anywhere you want on my website or just go to my name hyken.com. H-Y-K-E-N. well, fantastic. Thanks for sharing your wisdom and thanks for being here and leaders the trenches. Thanks for having me. Gene Hammett: Wow, what a great interview. I love what I do and I love bringing you great content and great wisdom from people who are out there doing the research on the front lines. They’re in the trenches, so to speak, so hopefully you’re enjoying these shows as much as I enjoyed creating them and if there’s anything I can do for you, make sure you reach out and say hi and if you see my ads, if you see anything on social media, make sure you comment or share it with someone that you think would appreciate it. Alright. As always, lead with courage and I’ll see you next time.